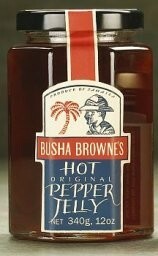 The first in The Busha Browne range are three pepper jellies, which are today being prepared and bottled by the Busha Browne Company in Jamaica exactly as they were 100 years ago, in three distinct flavours: Original, Lime and Ginger. The addition of these spicy jellies will, like a relish, enhance any meal. The Original Pepper Jelly is perhaps the most versatile. It is perfect with lamb or beef but equally good added to hamburgers, hot dogs and spaghetti sauces. All three pepper jellies make superb glazes for vegetables and they are delicious used with spreads, especially with cream cheese on crackers. The pepper jellies contain no additives, they are natural products and once opened should be stored at a temperature not exceeding 60 degrees Fahrenheit. .